Fisheries in Rocky Mountain National Park have a long history. Before the park was established, inn keepers and lodge holders would stock ponds and lakes with non-native fish to ensure the recreational enjoyment of guests staying at their establishments. Today, officials and researchers with the National Park Service are working to return the park&apos;s waters to their natural states, containing only native species of trout and bringing the populations of the trout back to their original glory. 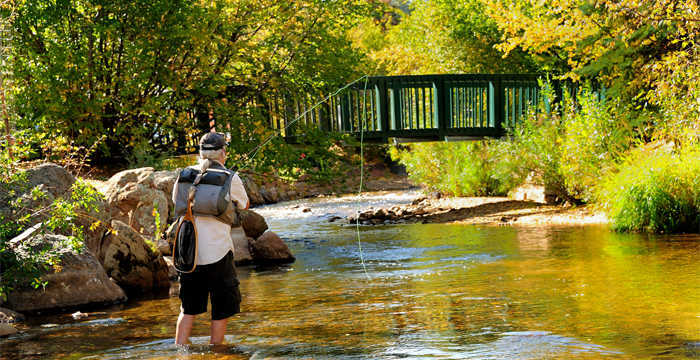 Sport fishing has remained a popular activity throughout all of RMNP&apos;s environmental changes, however, and many visitors still come to Estes Park to continue the tradition of fly-fishing. Here, we count down the top five hot spots for fly-fishing in and around Estes Park, and the most useful pieces of advice for novice fishers. 1. Big Thompson River - From the Fisherman&apos;s Bridge along Bear Lake Road upstream to the Fern Lake Trailhead. This area fishes well throughout the year. During the summer months it receives a lot of pressure, so don&apos;t be afraid to explore the areas a bit further from the road to find less spooky and larger fish. Be sure to arrive early to grab a parking spot if you wish to start your day near the Cub Lake or Fern Lake trailheads. 2. Mills Lake, Loch Vale, and Lake Haiyaha loop - From the Bear Lake or Glacier Gorge trailheads, embark on a moderate hike to any or all of these three high altitude lakes for stunning views and relaxing fishing. Each lake offers something a little different: Mills Lake&apos;s size grants plenty of areas to cast without intrusion, Loch Vale offers great fishing both in the lake and along Icy Brook at both the inlet and outlet of the lake, and Lake Haiyaha is surrounded by giant boulders that provide plenty of cover for fish habitat. When at the lakes be sure to look for fish cruising just below the surface near the shores or along the edge of the shallow shelf. 3. Glacier Creek - From above the Storm Pass Trailhead downstream to the Glacier Basin Campground, there are many places along the creek to catch trout. Glacier Creek is one of the few areas of the park where you can land the grand slam! Be sure to fish the seams along the main channel and the tail outs after fast water sections. This area is tightly vegetated and may require some more technical casting. 4. Fall River - Upstream from the Lawn Lake Trailhead parking area. This area sees less visitation than most front-country fishing areas in Rocky. Don&apos;t be afraid to get into the elk exclosures and fish among the new willow growth. It may make for some tougher casting, but the fish prefer this habitat. As the river meanders through, be sure to fish both the shallow gravel bank on the inside of each bend, along with the deep undercut bank on the outside. 5. The Big Thompson River Below Lake Estes - Perhaps one of the most popular and productive fishing spots around Estes Park, you can find a variety of fish, including non-trout species. The best time of day is in the evening, as the pressure decreases. 1. Check in with a local fly shop to see what the hot flies are during your visit. Local experts will have the best knowledge on the types of flies that are most likely to bring in a good catch. 2. Avoid the crowds by getting to your fishing spot early in the day or late in the evening. Before 10 AM or after 5 PM you are more likely to get a secluded and successful fly fishing experience. 3. Don&apos;t be afraid to experiment with your flies! Fishing a nymph under a dry fly may give you an advantage, as the majority of a fish&apos;s diet comes from subsurface food sources. 4. Fish are easily spooked and can often see you before you even cast, so savor in the serenity of your experience and move slowly as you walk along creeks or wade in shallow water. 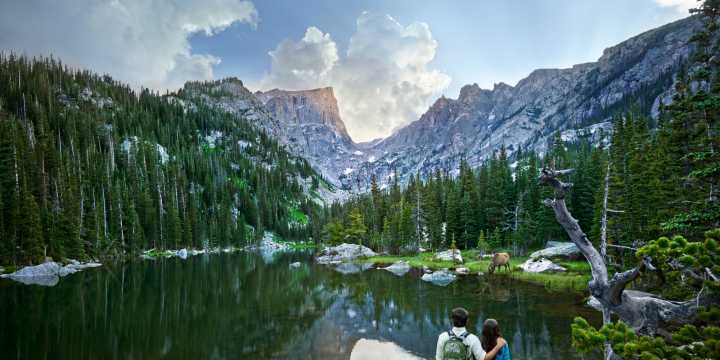 As you plan your next fishing adventure in Rocky Mountain National Park and the surrounding Estes Park area, consider the places and tips mentioned above. Fly-fishing is a great way to connect with the natural beauty of Colorado and RMNP provides an excellent backdrop for expert and novice fly-fishers alike! The Rocky Mountain Conservency is a non-profit providing nature seminars for everyone in the family. For more information on classes and seminars click here!